Size: Andean condors measure on average between 3.3 and 4.3 feet (1-1.3 meters). Wingspan: The wingtip to wingtip length of this bird can be up to 10.5 feet (320 cm). Weight: Males weigh around 24.2-33 lbs (11-15 kg) while females are lighter at 17.7-24.2 lbs (8-11 kg). Color: Adults are entirely black, except for the base of the neck, which has frilly white feathers. The flight feathers in adults too, are white. Juveniles have brown and olive-grey feathers. 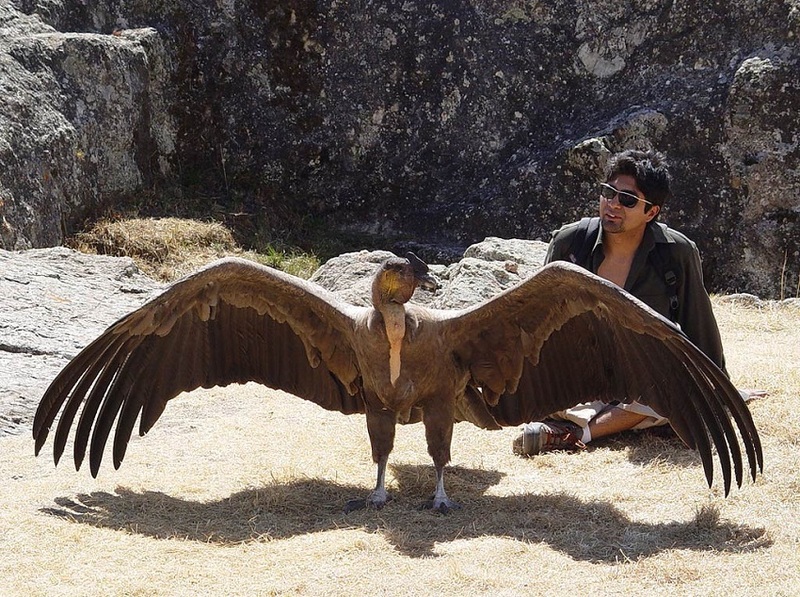 Sexual Dimorphism: Unlike most other birds of prey, male Andean condors are larger than females. The color of the irises also differs, with males having brown ones, and females red. Males also have a comb on the crown of their head, something that the females do not. 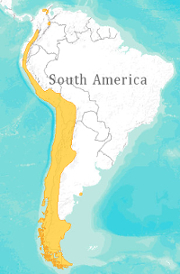 This large bird widely distributed in the Andes Mountains of South America, ranging from Venezuela, Colombia, Ecuador, Peru, Chile, Bolivia, Argentina, continuing onto the Tierra del Fuego, the archipelago south of South America. They can be found in alpine areas up to 16,000 ft (5,000 m), open grasslands, and coastal regions. Particularly non-forested areas are preferred that aid them in detecting carrion from afar. These birds are active during the day and can travel as much as 200 miles (320 km), soaring at high altitudes looking for food. Juveniles and adults roost communally on rock ledges and shelves. Adult males dominate over females, and adults, in general, dominate over the young. Being a soaring bird, it prefers to roost in high places so that it does not need to flap its wings too much to attain flight. 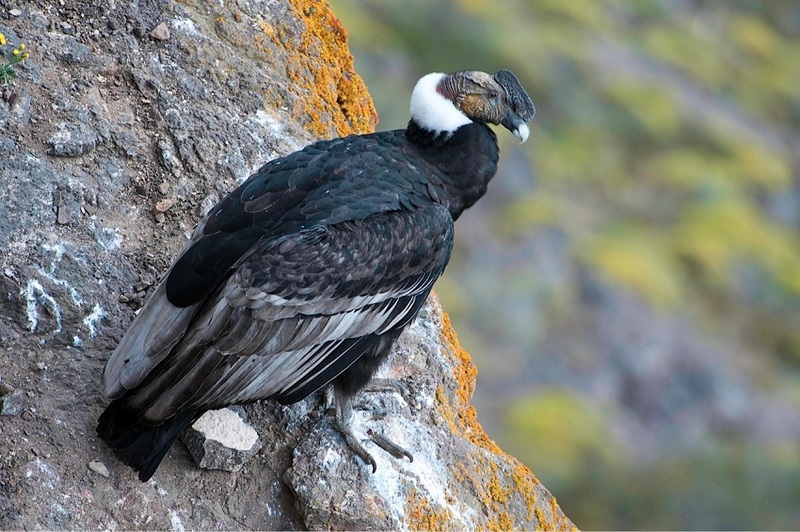 Andean condors are scavengers and prefer large carcasses of cattle, deer, llamas, alpacas, rheas, and armadillos. In the coastal areas, food supply is plentiful, and these birds usually follow other raptors to carrion. 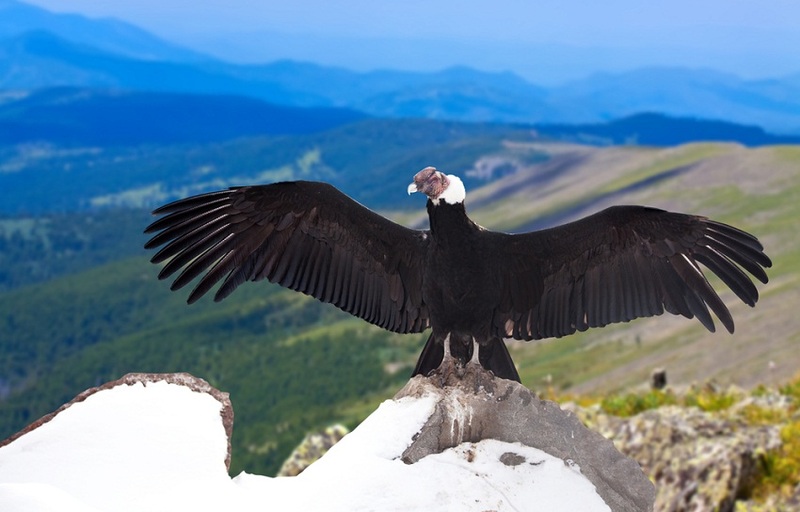 Andean condors are monogamous and mate for life. They do not build nests and lay the eggs with a few sticks around them on rock ledges. They breed one every 2 to 3 years, depending on the food resources. Usually, the clutch consists of just one egg, which is incubated for 2-3 months. 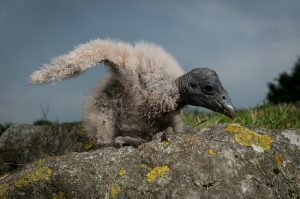 The hatchling is looked after by both parents till it is ready to fledge, which can take up to 7 months. The offspring may stay with their parents for 2-3 years before it becomes independent. 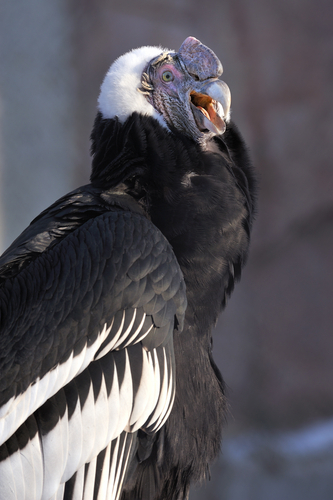 Sexual maturity is attained when an Andean condor is about 5 or 6 years of age. 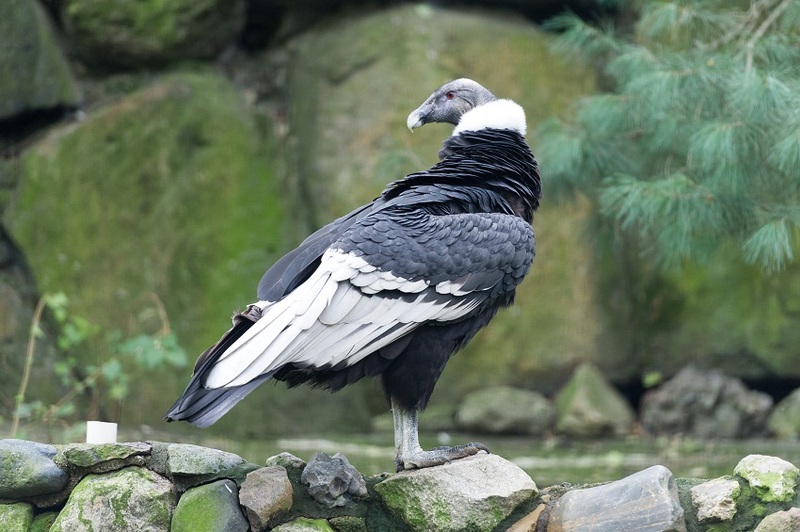 This is a long-lived bird and may live for up to 50 years in the wild. This high longevity is attributed to the facts that it matures slowly, and has no natural predators in the wild. In captivity, there are individuals to have lived for 80 years. 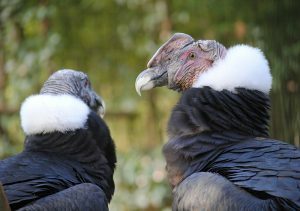 Both sexes of Andean condors have a patch of bare skin on their necks, the color of which they change as per their moods. They also use clicks and hisses but are less vocal than other birds because they lack the syrinx necessary to emit complex sounds. 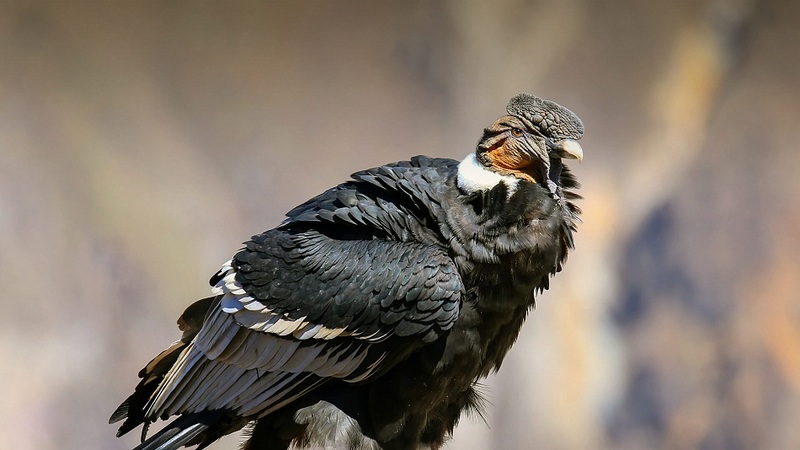 These birds have excellent eyesight that helps them spot carrion from very high altitudes and long distances. The featherless head and neck are thought to be to ensure that those areas can be cleaned easily after feasting on carrions. The hooked beak aids in tearing meat of carcasses. The long neck helps in tunneling into a corpse to get to the meat. The feet and talons of this bird are not conducive to grasping, so it does most of its feeding on the ground. 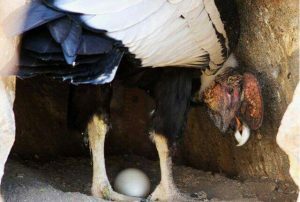 Adult Andean condors do not have any natural predators, but hatchlings, chicks, and eggs may fall prey to other raptors and foxes, the latter only if the nest can be accessed by terrestrial predators. These birds are classified as ‘Near Threatened’ by the IUCN. The main challenges to its existence are habitat loss and poisoning of carrion by hunters who consider this bird a pest. 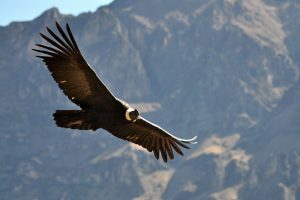 The Andean condor is the national symbol of many countries in South America, including Argentina, Colombia, Ecuador, Chile, and Peru. These condors share a mutually dependent relationship with the yellow-headed vulture and turkey vulture. The latter two species lead the Andean condor to carcasses, and the condor, in turn, rips into the dead animals through the tough hides; too tough for the smaller vultures to rip through. Andean condors play a significant role in the ecosystem by disposing of the carrion. The length of their wingspan is exceeded only by four other birds, with the longest wingspan belonging to the wandering albatross.